Back in my teens, when you signed schoolboy forms at 16 at Old Trafford the reward from the club would be two tickets for the directors’ box. That was how I came to have a very good view of that 21-man brawl between Manchester United and Arsenal players on Oct 20, 1990. 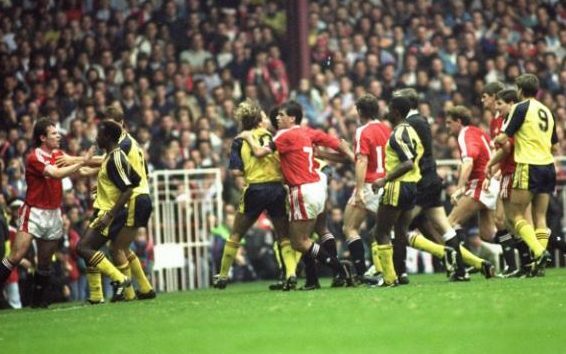 It is still the only game in which top-flight teams have been docked points for player misconduct – two in the case of Arsenal, one for United – and watching it unfold on the day I can only say I was transfixed. Was this professional football as it was going to be? Or did the two clubs share a rivalry so intense that at times it was very close to being out of control? Brian McClair (left), the United forward, has a chat with Michael Thomas and Tony Adams of Arsenal during a heated game at Old Trafford over a quarter of a century ago. CREDIT: GETTY IMAGES. Maybe I got a little sense that day of what much of my professional life as a United footballer was destined to be – locked in battle with Arsenal. Thirteen years later as a senior player at United I travelled down to London with a young team-mate for a Football Association disciplinary hearing, the only one in my entire career, after another ruck with Arsenal at Old Trafford. My companion that day was an 18-year-old Cristiano Ronaldo, in his first season in English football, and fairly bewildered by the whole experience of facing the FA. 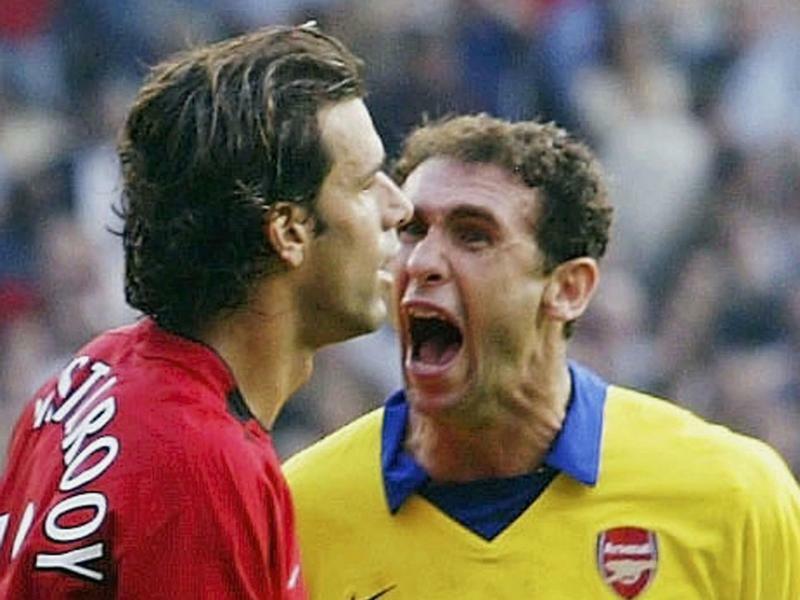 We had both got involved in the aftermath of Patrick Vieira’s sending off in a game in October, that preceded Ruud van Nistelrooy’s penalty miss and Martin Keown’s reaction and then all hell breaking loose. Did I deserve my £7,500 FA fine? Look I might have kicked someone, and that someone might have been the Arsenal full-back Lauren, but that was not what annoyed me about our day in London. What upset me was the way they treated Cristiano. He could hardly speak a word of English and the whole thing was very confusing to him. I told the FA’s barrister his treatment of Cristiano was over the top and too harsh and that was extremely damaging for a lad who had the potential to go on to be a star. Neither of us got a suspension. They fined Cristiano £4,000 although I’m pretty sure to this day that he has no idea why. Martin Keown famously 'got in the face' of Ruud Van Nistelrooy after the Dutchman missed a penalty in 2003. CREDIT: GETTY IMAGES. Perhaps it was just a United-Arsenal thing, because of all the teams I came up against in my career there was a long time when that fixture, which will be played at Old Trafford on Saturday lunchtime, was the one that could define the season and, more often than not, decide the title race. I didn’t have a great goalscoring record against them personally – just three goals, although one of them in particular sticks in people’s memories. What I remember was the sheer intensity of the games in those first 15 years of my career; after that, in the 'Emirates era', I think we had Arsenal’s number. 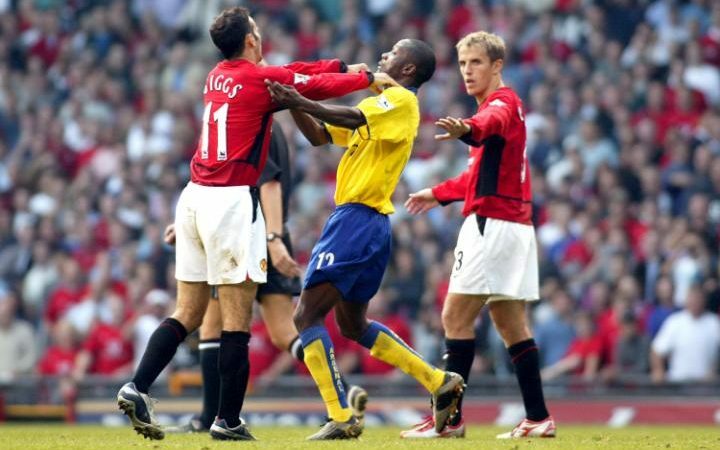 Giggs confront Lauren during the game at Old Trafford in 2003. CREDIT: GETTY IMAGES. My first game against Arsenal was a 1-1 draw in Oct 1991 when they were the reigning league champions. That period was a great team, including that famous back five and the likes of David Rocastle, Paul Merson, Alan Smith and Ian Wright. But the best Arsenal team that I played against was the double-winning side of 1998, including Vieira, Emmanuel Petit, Marc Overmars and Nicolas Anelka. They had everything. They had that same back five with a strong British base to it, including Ray Parlour in midfield. They were ready to out-play you, or out-fight you, and in that respect they were similar to Sir Alex Ferguson’s best United teams. When you faced them they asked the same questions that all great teams pose. What have you got? And, is it really enough to beat us? In those days I would be up against Lee Dixon, now my fellow ITV pundit. That is not the reason that I will say that Lee was a very good footballer. He was not lightening quick but neither was he slow. Most of all he was a very intelligent defender. The parallels were there with our own Denis Irwin. As with Denis I never felt that I could dominate Lee in the way that I could other full-backs. There might be times when you got past Lee but his reading of the game meant that it would not happen the next time. He was rarely out of position and he definitely had an advantage at Highbury which was such a tight pitch. We always used to say of that place, that it was not a winger’s pitch – not in the way that Old Trafford was and still is. In those days, Arsenal’s star was Vieira. He was the kind of player you would much rather was in your team rather than against you but unfortunately we did not have that luxury. He was a leader on the pitch and part of a spine of the team that was very strong. I will never forget the team talk from Sir Alex before the game between us and Arsenal in October 2004. They were league champions and on a 49-game undefeated run. Although it was already a record that half-century would have made it even more special. Sir Alex stood before us that day and reminded us of our responsibilities as United players. “We are the kind of club that should be setting those sorts of records,” he said. The message was clear. Arsenal had enjoyed their moment but it had to stop now, and we were the team to do it. The following February at Highbury there was that famous televised row in the tunnel between Vieira and Roy Keane before the match. As I recall it, Vieira had called it on with Gary Neville and Vieira had actually run into our changing room before the match to find Gary. When I came in from the warm-up there was already a conversation about this going on between Gary, Sir Alex and a few of the players. It was around this time that Keaney had got wind of it, and decided he was going to do something about it. Most of what he said was caught on camera as the two teams lined up. If you listen closely to Keaney it is not like he is ranting. Okay, he is pretty angry but he has also put some thought into what he is saying. Roy was intrigued by the notion that Vieira had projected this image of himself which he did not agree with. I think at some point Roy was shouting at Vieira about why, if he was so dedicated to Senegal, did he choose to play for France. He might have been angry but he was also looking for Vieira’s weaknesses, trying to push the buttons that would affect his performance. 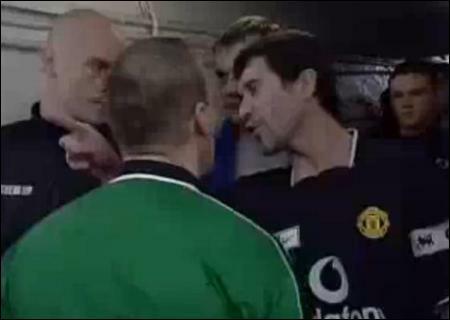 Roy Keane famously took on Patrick Vieira in the tunnel at Highbury. Either way, the thing about Keaney was that he could have that kind of row before a game but it would not affect his performance a single bit. As for the rest of us, we were so fired up. You could feel the electricity in the tunnel. No-one on our side could wait for the game to start. That was a good night for me: two assists for Cristiano and a goal myself in a 4-2 win. At the end of that 2004-2005 season we lost the FA Cup final to Arsenal on penalties, Vieira’s last game for the club and his last action was taking the winning penalty. I still don’t know how we didn’t win that match. By then we were getting on top of Arsenal and even though we did not bring the FA Cup home, the party afterwards, normally a miserable affair if you have lost, had a different kind of atmosphere to what might have been expected. I guess it was because although we had not won the FA Cup, we could see that better times were around the corner with Cristiano and also Wayne Rooney, who had just played his first season in the side. For Arsenal it would be another nine years until they won their next trophy. In those years either side of the millennium the competition between the two sides was so intense that you felt that both managers were looking for any small advantage they could give their teams. That was what their rivalry grew out of, I believe, although obviously I only saw it from one side. I got the feeling that Sir Alex felt that he could put a bit of pressure on them now and then. It might just be something innocuous in a press conference, saying that they were the favourites to win the title. Just something that placed a seed of doubt in their minds and made them think more than they might usually have done. One year after the FA Cup final of 2005, Arsenal reached the Champions League final and then moved to the Emirates the following season. Of course, they still had Thierry Henry for one final season and he was a wonderful player, unplayable on his day. Like Cristiano he was a footballer who developed into a very powerful specimen yet had so much natural ability too. But we always felt that the Arsenal team which developed after 2005 were beatable. A new side was growing at United with Cristiano and Wayne but also other tough, clever players like Darren Fletcher, Ji-Sung Park and Nani. At the Emirates we would counter-attack them and had a reliable way to beat them, which we never had before then. Arsenal have always had wonderful footballers, and they still do. Sir Alex would say to us: "The way to beat them is not to try to play them at their game. Play them at yours." So we would hit them with pace and power. The two Champions League semi-final legs in in 2009, when we won home and away, were the perfect examples of how to take on Arsenal. Gradually we found ourselves tested more against other rivals, Chelsea and then more recently, Manchester City. I suppose the moment that really told us that the game had changed was when we signed Robin van Persie in 2012. You cannot imagine what a lift it was for our dressing room when he walked in that summer, a top player who was ready to hit the ground running in the Premier League. How often do you take another big English club’s best player off them? We had done the same with Spurs and Dimitar Berbatov four years earlier but this was even bigger. Robin was a world-class player and he scored the goals, more than any other player in the 2012-2013 season, that took us to the league title. It is a team game but if you had to pick one player who was decisive that season then it was him. Now I look at the current Arsenal team and see good footballers throughout it: Alexis Sanchez, Mesut Ozil, Santi Cazorla, Aaron Ramsey, Alex Oxlade-Chamberlain. I like the defensive pairing of Shkodran Mustafi and Laurent Koscielny. This is a very accomplished footballing team and on their day they could beat any side in the world – and I mean that. Although that is not the same as being able to win the title. I have a few Arsenal friends down in London and I know that there are supporters who are unhappy with Arsene Wenger. I do not know the man himself but I can imagine the effect he has on the club. Sir Alex had a powerful hold over United and I should think that Wenger’s is no different. It reaches every part of the club and the man himself has an influence over every single working part. I know better than anyone the power of a manager like that and what happens when he walks away. Replacing him is not as simple as you might have been led to believe. Wenger knows how to build a football club and he knows how to build a team. I can say that with first-hand experience, having had some of my most memorable battles against them over the years.